Purchasing a home is a huge decision. This is especially true when choosing to build a custom home. However, it is also one of the most rewarding decisions you’ll ever make. Here are our top five reasons to work with a custom homebuilder. Do you disdain that your washer and dryer is in the basement or that your master bath only has one sink? A custom contractor can fix that for you! Working with a custom home builder allows you to take all the inconveniences or annoyances about your current home and correct them. Working with a custom contractor lets you create a custom kitchen that meets your needs, instead of adjusting your needs to your current kitchen. You get to work with an expert that helps you every step of the way. They’ve done this before and can give you ideas you may have never even thought of. You get the home you want on your budget. Because it’s a custom home, you get to decide what to prioritize. If having a garage is important to you but you really don’t need a powder room, your custom home contractor will design a home within your budget that will be exactly what you need. 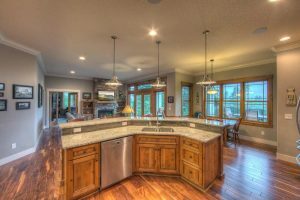 When working with a custom homebuilder, you can be confident that your home is of the highest quality. New construction is inspected often and must meet city and state code requirements throughout the building process. Your Rain Creek Construction contractor is an authority on the code and quality requirements and will ensure you get the best possible home for your money. 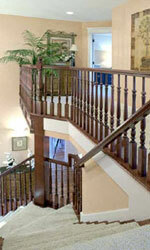 Working with a professional reputable contractor provides refreshing peace of mind. Your contractor does all the work for you. He or she will work with you on floor plans, fixtures, finishes, and all the fun stuff while also seamlessly relaying the information to the team of professionals working to complete your home. Using a custom home contractor relieves you from the burden of working with an architect, roofer, plumber, electrician, etc. When working with a contractor, you’re getting access to a professional with established relationships and knowledge of the home building industry. Their expertise will help you get the custom home you want while keeping costs in check. Custom home contractors use strategies like price comparisons and risk assessments to keep expenses down. If you have any other questions about the custom home building process, reach out to our friendly staff and we will be happy to help you! We encourage you to visit the rest of our site and would welcome your call any time. We would be happy to discuss your project and how we can work together to create the custom home results you’re dreaming of.